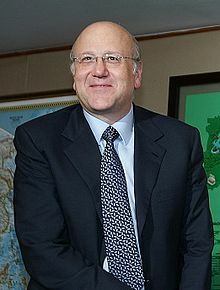 Najib Azmi Mikati (Arabic: نجيب ميقاتي‎; born 24 November 1955) is a Lebanese politician who served as the Prime Minister of Lebanon two times. From April 2005 to July 2005 he was Prime Minister of Lebanon in a caretaker government. On 25 January 2011, Mikati was nominated to serve as Prime Minister by a majority of the votes in the parliamentary consultations following the 12 January fall of the Lebanese government of November 2009. The government was formed on 13 June 2011, after many delays. On 22 March 2013, Mikati submitted his resignation from office, which Lebanese president Michel Suleiman accepted on 23 March 2013. Mikati was born on 24 November 1955 and hails from a prominent Sunni Muslim family based in Tripoli. He graduated from the American University of Beirut in 1980 with a Master of Business Administration (MBA) degree. He also attended a summer school program held at Harvard and the French business school INSEAD. Mikati co-founded the telecommunications company Investcom with his brother Taha in 1982. He sold the company in June 2006 to South Africa's MTN Group for $5.5 billion. In March 2012, Forbes estimated his wealth at $3 billion, making him the richest man in Lebanon. After being appointed Minister of Public Works and Transport on 4 December 1998, Mikati was elected to the Lebanese parliament from his hometown of Tripoli in 2000, outpolling Omar Karami, who was elected from the same multimember constituency. As a parliamentarian, Mikati retained his cabinet position and developed a reputation as a moderately pro-Syrian politician with a normal relationship with Syrian president Bashar Assad. Later Mikati was made transportation minister and became an ally of then Lebanese president Emile Lahoud, supporting the extension of his term in 2004. He was a perennial candidate for Lebanon's prime ministry since 2000, finally taking the office upon the resignation of Omar Karami on 13 April 2005. Mikati acted as a caretaker premier. He is the leader of the solidarity bloc, which has had two seats in the Lebanese parliament since 2004. He also created the centrist movement and ideology in Lebanon and the Arab world, for which he has held many international conferences in Lebanon. In the general elections of 2009, Mikati won again a seat from Tripoli, being a member of the centrist groups in the Lebanese parliament. During negotiations to form a government, Mikati emerged as a consensus candidate. Despite his closeness to Syria, his willingness to compromise and his promise to dismiss the chiefs of the security forces, whom many Lebanese suspected of involvement in the assassination of former prime minister Rafik Hariri on 14 February 2005, won him the support of the anti-Syrian opposition, who were opposed to Abdul Rahim Mourad, the strongly pro-Syrian minister of defense. "We will be the symbol of moderation and national unity," Mikati declared after being sworn in at the Presidential palace in Baabda. He was appointed Prime Minister by president Émile Lahoud on 15 April 2005 to succeed Omar Karami, who gave up after seven weeks of frustrated efforts to form a consensus government and resigned. Mikati held office for three months, with the position being transferred to Fouad Siniora on 19 July 2005. Mikati's immediate priority was to prepare Lebanon for crucial parliamentary elections, which were scheduled to be held by 31 May 2005. Constitutionally, a government must be in place to call for an election, and opposition politicians had accused president Lahoud and former prime minister Karami of stalling the formation of a government in order to thwart the elections, which anti-Syrian parties believed they could win. Mikati's government succeeded in organizing the election, which saw the opposition (by that time known as the 14 March Movement) win 72 out of the 128 seats in the National Assembly. On 24 January 2011, the March 8 alliance, specifically Hezbollah, Michel Aoun and Walid Jumblatt, nominated Mikati to become prime minister. Mikati succeeded Saad Hariri, whose government was brought down by the resignation of ten of the alliance's ministers and one presidential appointee on 12 January 2011, resulting from the collapse of the Saudi-Syrian initiative to reach a compromise on the Special Tribunal for Lebanon. On 25 January, 68 members of the parliament of Lebanon voted in favor of nominating Mikati for Prime Minister. President of Lebanon Michel Suleiman then invited Mikati to head a new Lebanese government. The process of government formation lasted for five months due to serious disagreements between leaders. On 13 June 2011, Mikati became the Prime Minister of Lebanon for the second time. On 13 June, Mikati announced the formation of the government and stated that it would begin by "liberating land that remains under the occupation of the Israeli enemy". On 22 March 2013, Mikati resigned from office, due to "intensifying pressure between the pro-Assad and anti-Assad camps" and the Lebanese president accepted his resignation on 23 March 2013. On 6 April 2013, Tammam Salam was tasked to form a new government. ^ "Mikati: new government will restore trust in economy". The Daily Star. 28 May 2011. Retrieved 6 March 2013. ^ a b "Profile: Najib Mikati". BBC. 25 January 2011. Retrieved 6 October 2012. ^ a b William Harris (19 July 2012). Lebanon: A History, 600-2011. Oxford University Press. p. 347. ISBN 978-0-19-518111-1. Retrieved 18 March 2013. ^ "Lebanese Power-brokers: The Most Powerful Families of Lebanon". Marcopolis. 15 October 2012. Retrieved 23 March 2013. ^ "The World's Billionaires". Forbes. Retrieved 4 January 2011. ^ "Profile". Forbes. March 2012. Retrieved 7 October 2012. ^ Fakih, Mohalhel (2–8 September 2004). "Pulling at Lebanon's strings". Al Ahram Weekly 706. Retrieved 19 April 2013. ^ Assir, Serene (21–27 April 2005). "Divided we fall". Al Ahram Weekly 739. Retrieved 15 April 2013. ^ Alaa Shahine; Massoud A. Derhally (13 June 2011). "Lebanon’s Mikati Forms New Cabinet With Hezbollah Support". Bloomberg. Retrieved 6 March 2013. ^ "Elections in Lebanon". IFES. Retrieved 22 March 2013. ^ Hosri, Danielle (16 April 2005). "Opposition-Backed Moderate Mikati Named Lebanese PM". Arab News. Retrieved 4 January 2011. ^ Salem, Paul (15 June 2011). "Lebanon’s New Government: Outlines and Challenges". Carnegie Middle East. Retrieved 21 April 2013. ^ "Lebanon PM: New government to liberate land under occupation of 'Israeli enemy'." Reuters, 13 June 2011. ^ Simon, Kevin (2012). "Hezbollah: Terror in Context". Olin College of Engineering. Retrieved 2 July 2012. ^ Salem, Paul (23 March 2013). "Lebanon Imperiled as Prime Minister Resigns Under Duress". Carnegie Endowment for International Peace. Retrieved 29 March 2013. ^ El Basha, Thomas (22 March 2013). "Lebanese PM announces resignation of his government". The Daily Star. Retrieved 22 March 2013. ^ "Lebanon names Tammam Salam as new prime minister". BBC. 6 April 2013. Retrieved 6 April 2013. Wikimedia Commons has media related to Najib Mikati. This page was last modified on 2 March 2014 at 19:21.